When Chuck Berry turned eighty last October, he played his regular gig at Blueberry Hill in his hometown of St. Louis. As far as I can tell, the national press didn't cover the story. Berry grew up in 'the Ville', a middle class black neighborhood in St. Louis. His mother, who sang with the Antioch Baptist Church choir, often held rehearsals right there in his living room. By the time he was six, Charles was joining in, and soon became a member, singing 'quartet style' with a few friends on the side as well. The music was all around him, and he loved listening to the radio late at night pulling in the blues from Kansas City and beyond. He brought the house down at Sumner High School when he got up on stage and ripped into Confessin' The Blues, Hootie McShann's 1941 smash. Chuck loved the attention, and began practicing on an old four string guitar somebody gave him, making it up as he went along. By his senior year, he had managed to get himself a proper six string, and became quite popular, playing whenever and wherever he could. In the summer of 1944, Berry and two friends took off on a road trip to Kansas City in his 1937 Oldsmobile. Before it was over they had been arrested for a supposed armed robbery and hauled off to jail. They were sentenced to ten years, and sent to the Intermediate Reformatory for Young Men, a juvenile prison in central Missouri. Making the best of a bad situation, Chuck soon formed a Gospel quartet with his inmates that became so popular they were asked to perform all over the state. As it turned out, the lead vocalist in the group (Po' Sam) was also a guitar player, and Berry 'went to school' on him, making good use of his time out of circulation. A 'model prisoner', Chuck was released after serving only three years, and was back on the streets of St. Louis by the time he was 21. He continued performing, and by now had developed his own style. 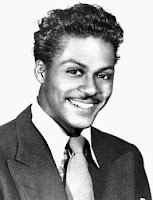 In 1950, Berry was working as a janitor at radio station WEW when a local guitarist named Joe Sherman offered to sell him his electric guitar for thirty dollars. He jumped at the chance, and was able to take his act to the next level. Before long he was playing regular gigs at local clubs, and becoming well known on the circuit. On New Year's Eve in 1952, Chuck got a phone call from Johnnie Johnson, whose group The Sir John Trio was scheduled to perform at the upscale Cosmopolitan Club, one of the top black nightspots in the state. Their sax player was sick, he said, and he wondered if Chuck could help him out and play with them that night. Berry's magnetic personality and unique guitar work was quite the sensation, and Johnson asked him to join his outfit. Before long they became the house band at The Cosmopolitan, and Chuck's sly mixture of country and blues earned him the nickname 'the black hillbilly'. Johnson, realizing that Berry was now the 'front man', agreed to change the name of the group to The Chuck Berry Combo. Along with drummer Ebby Hardy, Johnson and Berry made a name for themselves playing to packed houses in and around St. Louis. "Johnnie and I became so tight in feeling each other's direction, that whenever I played a riff... he would answer it with the same melodic pattern, and vice versa," Berry has said. Together they would change everything. As a black electric guitar player in the early fifties, Chuck couldn't help but idolize Muddy Waters. His music had come roaring back down the Mississippi from Chicago, giving voice to the shared experience of a generation. Songs like Louisiana Blues and Long Distance Call were positively huge down south, and were re-defining 'the blues'. By 1955, Muddy had placed nine consecutive songs in the R&B top ten, including the immensely popular I'm Your Hoochie Coochie Man, which was written by the great Willie Dixon especially for him. Waters had 'attitude', and plenty of it. Small wonder, then, that on a trip to Chicago in the spring of 1955, Chuck sought out Muddy. After watching his set at a crowded Forty-Seventh Street club, Berry introduced himself and asked for advice on who he should go see if he wanted to 'make a record'. "See Leonard Chess," Waters told him. Waiting in a doorway across the street until Chess showed up on Monday morning, Berry did just that. "Muddy Waters sent me," he said. Chess told him to bring some kind of demo tape or something, and sent him back to St. Louis. A week later he was back in Chicago with a home-made tape of four songs he had written. Chess especially liked a 'hillbilly' number called "Ida May," but wanted Berry to change the title as it was too close to Bob Wills' western swing hit Ida Red. 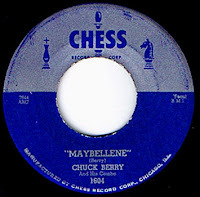 It was Chess who came up with the name Maybellene, supposedly after spotting the name on a box of make-up that belonged to his secretary. 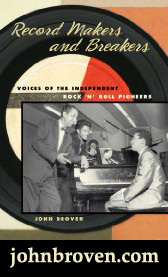 They entered the studio on May 21st, with Willie Dixon playing bass behind Berry and Johnnie Johnson. Inexperienced in the studio, it took them thirty six takes to give Leonard Chess the sound he wanted... the sound that would make history. 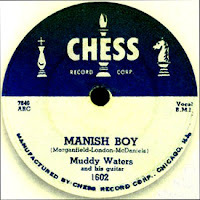 Muddy Waters' Manish Boy was released as Chess 1602, Maybellene was Chess 1604 (1603 had been a Gospel release by The Dixieland Singers). The baton had been passed. 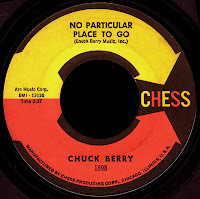 Chess personally delivered an advance copy to Alan Freed in New York, working out a deal that handed him one third of the composer's royalties (as he would later tell Etta James, "There's some deals you just have to make"). Freed was all over it, reportedly playing the record for two hours straight at one point. It became a huge smash, selling more copies than Chess could have even imagined. By August, it had topped all three of Billboard's R&B charts (Jukebox, Airplay, and Record Sales), and was blaring out of car radios 'motorvatin' across America. As it cruised to #5 on the pop charts that September, Leonard Chess was a happy man. 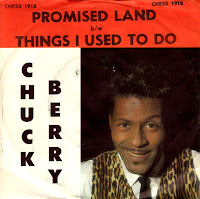 Berry was annoyed when he found out he was sharing his royalties with Freed, and made sure Chess removed his name from future releases (going so far as to list "Chuck Berry, Inc." as the composer on all of his songs from then on). He was a realist, however, and continued to 'play nice' with Freed, headlining his fabled Rock & Roll extravaganzas, and appearing in films like Rock, Rock, Rock and Mister Rock & Roll with him. 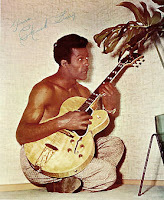 Songs like School Day and Sweet Little Sixteen continued to dominate the top ten, and by the end of the decade Chuck Berry was a force to be reckoned with. He began investing in real estate, buying up large tracts of land in and around St. Louis. 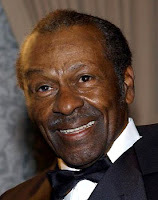 He opened a popular club in the downtown theater district called Chuck Berry's Bandstand, which served both blacks and whites, and had started work on an amusement park just outside of town that sported a hotel with a guitar shaped pool. The white establishment had seen enough. He was charged with violating the Mann Act, allegedly transporting an underage Indian girl "across state lines for the purposes of prostitution" in 1959. In a much publicized trial, he was found guilty by Federal Judge George H. Moore in March of 1960, and sentenced to five years in prison. 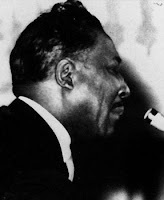 Charging 'racial improprieties' in his trial, Berry appealed the case before Chief Justice Roy W. Harper in 1961. The high court upheld the decision and he was carted off to prison in February of 1962, with his sentence being dropped to three years and a $10,000 fine. Both cases are still studied in Criminal Law classes today because they "demonstrate not only the racial prejudice which existed at the time of his trial, but also how courts and juries sometimes stretch or interpret the facts to fit a crime." In plain English, he was railroaded right out of the top ten into the Federal pen. 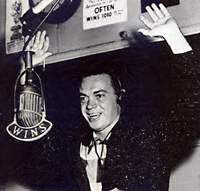 They got Alan Freed too... brought 'em down, man. You read things like 'Chuck Berry was never the same again' or 'he emerged from prison a bitter man'. Damn right. 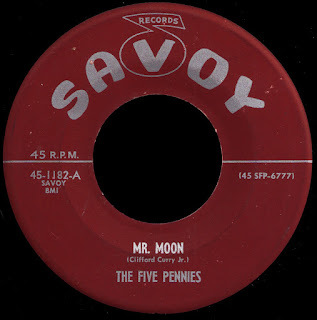 His incredible songwriting skills remained intact, however, and he was back in the top ten with No Particular Place To Go in the summer of 1964. Meanwhile, The Beach Boys had ripped the melody for Surfin' USA right out from under him, and the 'British Invasion' had begun, with nice clean white boys playing his music on the radio. Nevertheless, he continued to chart with great songs like You Never Can Tell and Little Marie before releasing our current selection. The flip of the amazing Promised Land (a song which would go on to be performed some 400 times by the Grateful Dead over the years), today's B side is a cover of Guitar Slim's 1954 blockbuster hit. 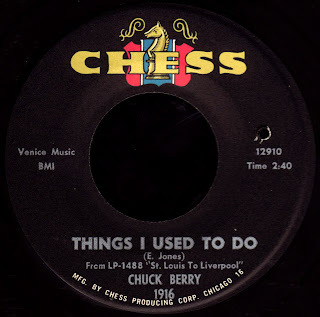 As far as I'm concerned, Chuck Berry is just as much a blues man as anything else, and I love his smoky driving attack on this great song we have here... check out Johnnie Johnson's piano! What a band this was, folks. You know you always hear that silly thing; 'the Blues had a baby, and they called it Rock & Roll'... well, as John Lennon once said, "...you might call it Chuck Berry." In 1986, Keith Richards organized a sixtieth birthday party for Berry at the Fox Theater in St. Louis. 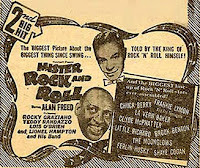 The resulting movie, Hail, Hail Rock & Roll was released the following year. While one good thing to come out of the film was the re-emergence of Johnnie Johnson, I think it did more to tarnish Chuck Berry's image than anything else. I remember going to see it with a friend of mine in London when it first came out, and leaving the theatre with the distinct impression that Berry was not a nice guy. A bourbon swilling Richards goes out of his way to tell the viewer how Berry was more difficult to work with than even Mick Jagger, and is forever crying about what key Chuck plays what song in. The movie has been released on DVD, with 'bonus footage' that further delineates what a hard time Taylor Hackford and the rest of the crew had making the film with such a Reluctant Movie Star. Poor babies. 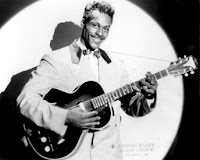 Chuck Berry is, in my opinion, another Black entertainer upon whom the mainstream American media has turned its back for not playing the game the way they want him to. James Brown was one, as is Ike Turner... I could go on. Consider the fact that he performed before sold-out houses in Moscow, Paris, Stockholm and Copenhagen on his recently completed 80th Birthday tour, while here in his home town he's playing in a bar. I'd also like to thank my compadre 'Coffee Al', for suggesting I write it in the first place. You speak the truth Red. Berry was an amazing songwriter. 'Almost Grown' is an alltime fave of mine. Nice one Red. Indeed he does deserve better, however Chuck has continually shot himself in the foot. St. Louis, his and my hometown doesn't exactly appreciate him. I've caught a few of his Blueberry Hill gigs, which are wildly erratic depending on his frame of mind on any given night. I caught one show, when I was living there about 7 years ago that was magical and transcendent: Chuck Berry in a tiny club as you always wanted to see him. I had some friends visiting from out of town the following month and told them "you have to see this!" Unfortunately, the next show he was out of tune, had trouble remembering his lyrics and finishing his songs. It was sad. 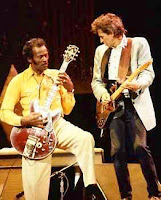 I'll cut him a lot of slack, because after all he is Chuck Berry, my favorite guitar player and the greatest songwriter of the rock 'n roll era. I'm just a fan of Rock N Roll and Chuck Berry is the master! Hail, Hail Chuck! 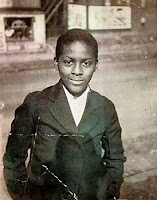 This is a great piece on Chuck Berry's life n times. America robbed him of a glorious life. 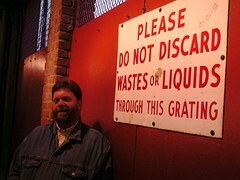 Good thing for us he didn't care. He knew his music was great and that it should be shared. I am forever in his debt. He is an inspiration to the human race. I hope to be as determined as Chuck with my life and my music. Someday I'll pay you back, Chuck. You, Jimi Hendrix, Muddy Waters, Robert Johnson and of course Ludwig Van Beethoven. I'm learning a lot now about Chuck Berry. I'm especially listening to his perfomance at the bbc in London in 1972. 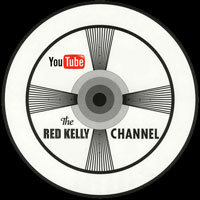 (search for chuck berry london in youtube and you'll find all the songs he played that night.) It's just amazing. Especially like "Can't stop the train". Just amazing how he playes. Makes me wanna buy a guitar and learn to play as well. If only I had the time. Finding out that he pretty much created most of what is now rock & roll, I have nothing but respect for him. Love this site and pleased to hear other people that love 'The things I used to do'. I inherited this track from my Big Brother as a single with as mentioned the 'Promised land' as the A side but still prefered the B side. I feel this really shows Chuck's Blues side and along with 'Nadine' shows Chucks early stuff to be fantastic. A wonderful post on a wonderful website. Thanks! John Lennon didn't make up that quotation about Chuck being synonymous with rock'n'roll -- he just read it off a cue card, and the credit really goes to some unknown Mike Douglas Show writer.